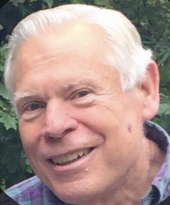 William S. Stimmel III, 80, of Stahlstown, died Monday, December 3, 2018 at his home. He was born July 29, 1938 in Pittsburgh, a son of the late William S. Stimmel, Jr. and Harriet Wainwright Stimmel Wolfe. Prior to his retirement he had been a real estate agent for several Pittsburgh area real estate brokerages. He was a member of the Amateur Ham Radio Assoc. In addition to his parents he was preceded in death by his wife, Kathryn Vollmer Stimmel in 2007. Mr. Stimmel is survived by two sons, Richard W. (Julie) Stimmel of Wexford and Brian E. (fiancé Brianne Jenko) Stimmel of Cranberry, and three grandchildren, Ashley, William, and Madison Stimmel. Private services will be held Friday at 11:00AM at Homewood Cemetery in Pittsburgh followed by entombment in the Stimmel Family Mausoleum. The J. Paul McCracken Funeral Chapel, Inc., Ligonier, is assisting the family. To send flowers or a remembrance gift to the family of William S. Stimmel III, please visit our Tribute Store. "Email Address" would like to share the life celebration of William S. Stimmel III. Click on the "link" to go to share a favorite memory or leave a condolence message for the family.